Here's an adventure travel tour covering an astounding diversity of Icelandic landscapes and locations including the Highlands, glacier regions, and Eastfjords of Iceland. 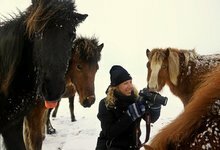 This 9 day moderate-intensity small-group tour explores some of Iceland's most stunning, and remote locations, via 4x4 vehicle, offering a unique itinerary that's simply unmatched in terms of breadth or price for a trip of this length. We spend one-third of our time in the Highlands of Iceland exploring the famous Landmannalaguer area, Fjallabak Nyðri 4x4 route, and Langisjor glacial lake. 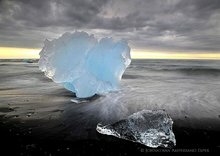 Then we leave the Highlands and spend some days in the ever-poplular Jökulsarlon glacier lagoon and Skaftafell glacier areas, which are many tourists' favorites. Our final days find us exploring the East Fjords region which is less visited but equally stunning, filled with old bridges, glacial rivers, fjord valleys, and secret waterfalls. 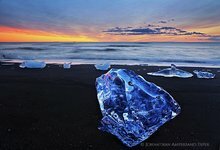 So many photo trips around Iceland skip the Eastfjords altogether, and so this trip was specially designed to combine the Eastfjords with a 4x4 Highland photography adventure, as well as the classic glacial destinations of Iceland, with are 3 of the most unique and unforgettable Icelandic geographical types. Day 0 (13 July): Arrive Keflavik airport, day in Reykjavik city on your own, pre-trip evening meet-and-greet. (Reykjavik hotel accomodation not included). Day 1 (14 July): Official start of the tour. The famous Golden Circle sights of Thingvellir, Gullfoss waterfall and Geysir and the hidden Bruarfoss rapids. Overnight in Fluðir guesthouse, evening at a secret natural hotpool nearby the guesthouse. Day 4 (17 July): Leave the Highlands region, past rural and farm scenics of the southeast region, and onto the Skaftafell National Park and Svinafell glacier regions. Glacier ice walk with a local ice guide included. Optional Svartifoss waterfall short hike. 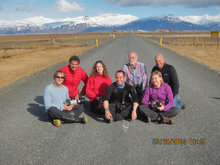 Overnight near the glaciers in Skaftafell Hotel. Day 5 (18 July): Full day enjoyed at the ever-popular Jökulsarlon iceberg lagoon and iceberg beach. Fjallsarlon iceberg lagoon exploration. Overnight nearby lagoon in nice country hotel. Sunset enjoyed over glacial lagoon. Day 6 (19 July): Morning tractor tour across tidal flats out to the puffin colonies on Ingolfshofði headland. 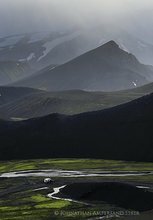 Heinabergsjökull and additional glacier lagoons and mountain vistas, in the southern Eastfjords region. Outdoor hot-pools at Hoffellsjökull. Sunset at Vestrahorn and Stokkness, overnight in Hofn. Day 7 (20 July): Eastfjords secret waterfalls, fjord valleys, coastal mountains, and old bridges. Overnight in picturesque fishing town of Djupivogur. Day 8 (21 July): Longer drive back westward, with many scenic stops along the way including Fjaðrárgljúfur canyon, and the Laki craters eruption fissure, with some time spent hiking among the craters. Arrive to Vik y Myrdal for dinnertime, and sunset enjoyed on the black sand beach by the Reynisdrangar sea stacks. This incredible 9 day adventure tour around Iceland, the legendary land of fire and ice, is meant for energetic travelers passionate about exploring the outdoors, and who desire to see and casually photograph Iceland extensively. 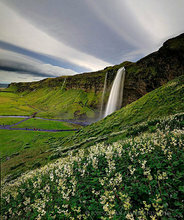 The busy itinerary is designed to help you discover Iceland's inaccessible, under-photographed, and most beautiful and rugged of all of Iceland’s diverse geographic areas, and also includes plenty of stops at many of the popular natural attractions that are considered must-sees. We drive in a large loop over many famous and rough 4x4 tracks as well as much of the coastal Ring Road, beginning and ending at Reykjavik. 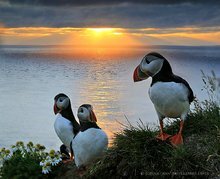 We’ll enjoy Iceland’s long summer daylight hours as we explore highlights including erupting geysers and geothermal areas, nuzzle with Icelandic horses in idyllic green pastures, peer over sea cliffs alive with hundreds of thousands of birds including puffins, swim in warm volcanic springs, hike up mountains for panoramic vistas of Iceland’s green mountains, explore some of Iceland’s stark highland regions, and photograph and walk on Iceland’s glaciers. Photography and guiding: If you're a photographer, there's ample opportunities for personalized photographic coaching in the field from a full time working pro. While this trip isn't focused on photography as the other trips by this leader, your trip leader is a passionate photographer at heart and will always take the time to capture great moments and scenes, and is happy to help you out in your shooting. A maximum group size of 6 photographers provide an intimate small group adventure experience, and ensures the group maximum flexibility, too, so we can spontaneously see more and go more places if there's good light and weather. This photo tour will only have in-the-field photography and casual situational instruction working alongside your leader. Physical Level: This adventure tour is suitable for adventurous travelers of moderate or better fitness levels. We will be going on several hikes throughout the trip to truly experience Iceland, in duration of anywhere from 15 minutes to 3 hours. Group participants may stay behind, or explore around closer to the vehicle on their own, if they're not up for a particular hike, and/or wish to pursue individual photographic or sightseeing objectives, enabling each participant to get the most out the trip. Importantly, since this trip has an intensive itinerary, a good positive travel attitude and energetic aura will go a long ways to helping you get the most out of the trip. Pro Leader: Johnathan Esper of Wildernesscapes Photography LLC in the USA will be leading the trip. 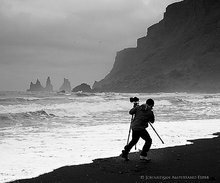 Johnathan is a full time photographer and experienced international photo trip leader, and this will be his 30th+ trip he's led to Iceland since begining Iceland trips in 2011. Every trip so far has been an incredible experience for the participants. 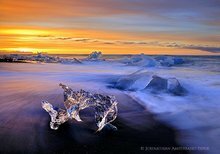 Johnathan has a unique background and an intimate knowledge of the land from living out of a car, exploring and photographing Iceland intensively for months at a time. 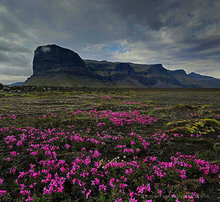 Trip Details: The cost of this tour is $2990 USD (or Euro equivalent), all inclusive, and includes all sightseeing opportunites and photographic professional instruction as needed, all ground and 4x4 transportation, all accommodation for 8 nights (accomodation will vary, with the majority of nights spent at Icelandic guesthouses and country hotels, (rooms often, but not always, have private in-room bathrooms)(based on double occupancy), (single supplement add $50/nt), with 1 night spent in Icelandic Highland wilderness huts with very basic sleeping bag accomodation (sleeping bags provided)); all meals and food (breakfasts provided by our guesthouses, picnic-style lunches and snacks including Icelandic smoked salmon, locally grown fruits, sandwiches, etc. ), and hot dinners at our places of accomodation and/or restaurants, and one more-basic camp-cooked meal while at the Highlands huts), professional glacier guides, and all entry fees and activity fees and other guides listed in this itinerary. A $500 deposit is due at the time of registration, and the remaining balance is due by the trip start. Refund info see below, with a mix of cash refund and future trip credit, depending on cancellation date. This tour is open to all travelers with up-for-it travel attitudes and moderate physical fitness, and also welcomes casual photographers. A trip packing list will be provided. There is a maximum group size of 5, and a minimum of 3. We'll be so immersed in the Icelandic countryside for our entire time as a group, that we have left no time to enjoy the sights of Reykjavik, so we encourage you to stay in Reykjavik for a couple days on your own, either before or after the tour. If you have additional questions, the trip leader will be happy to answer them via email. To book your space on this trip, please pay a deposit payment of $500 USD per person. Until payment is sent, your place is not guaranteed. You may conveniently pay your deposit here on this website, securely with your credit which will be processed by Paypal payment processor. The deposit portion may also be paid via personal or bank check for USA and Canadian clients; contact me for further instructions.